The easiest an cheapest way to get and carry cash abroad, especially in Europe, is the same way you do at home: Simply use the ATM card linked to your home checking account to get Euros out of street corner ATMs. 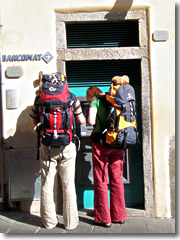 Backpackers using a bancomat (ATM) in the Cinque Terre fishing village of Riomaggiore.If your ATM card is on the MasterCard/Cirrus or Visa/Plus networks—and virtually all bankcards are, whether your local system is called Mac or Star or whatever (look for the name and symbol on the back of the card)—then you will be able to get cash out of Italian ATM machines. Just like at home, it will withdrawal the money directly from your checking account, convert it into Euros—at a more favorable exchange rate than you'd get changing cash or traveler's checks inside the bank at a teller window—and spit out Euros. Couldn't be any easier. In Italy, cash machines are called "bancomat," (pronounced with long "a"s as "BAHN-ko-maht"). As in the US, you can find banks on almost every block in major cities and on the main squares or main drags in smaller towns. All of them come equipped with an ATM machine willing to spit out local cash just as soon as you stick in your bank card and enter your PIN. If you have trouble finding one, just ask for a bancomat (this term, incidentally, works all over Europe). Virtually all ATMs will accept a card from any of the major networks, so you really don't need the automated locators provided by MasterCard/Cirrus (www.mastercard.com/atmlocator) and Visa/Plus (visa.via.infonow.net/usa_atm). 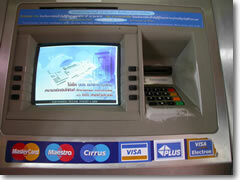 ATMs (cash machines) look the same in Italy and, indeed, all around the world—even this one in Thailand—and any one that displays the stickers of all the major cards and networks will most likely accept your home bank card.The reasons to use an ATM (over any other method of getting cash abroad) are legion. You don't have to stand in long lines at the bank or local American Express office, waiting to hand over your passport as ID in order to cash traveler's checks then forking over a commission of 10% or so. With an ATM, you just saunter up, stick in your card, punch in the PIN, and it spits out local cash. No fuss, no commission, no lines. Best of all, the cash comes at a lower exchange rate and there's no commission, as Italian banks have not (yet) hit upon this method of nickel-and-diming us out of that extra $1.50–$4.50. I have heard that some American banks have begun charging a higher fee for international withdrawals and, sadly, many U.S. banks are also now charging an additional "foreign exchange" fee for withdrawing money abroad—even though it doesn't cost them a single cent (or euro) extra; it's just a way of stealing more money from you. Ask your local bank before traveling to avoid a nasty surprise. You can get much more on this (and other financial issues) at the excellent financial planning site BankRate.com (bankrate.com) and at this wiki on FlyerGuide.com. If your home bank charges the usual $1 to $3 fee for using an out-of-network ATM, you will see that on your bank statement. Not that many smaller banks and credit unions do not charge these out-of-network fees. Make sure your bankcard is linked to your checking account, as some banks won't let you withdrawal from your savings account at foreign ATMs. Make sure your PIN is only 4 digits long (not six), as some European banks won't accept longer ones. Make sure you let your bank know you'll be making foreign withdrawals. Banks sometimes have automated software that looks for suspicious usages that might imply theft—i.e. you card is suddenly being used for lots of withdrawals, far from home, for larger than usual amounts—and freezes your account to protect you. That’s very nice...unless you are the one making larger than usual withdrawals far from home! By the way, same rule goes for your credit cards. Know that you will get an even better rate (an average of 9% better) if you avoid using ATMs and cash at all and instead use a credit card wherever possible. What about getting cash advances on my credit card?